Strawberry Rhubarb Pie - Do You Know The Muffin Man? Notes: The next item up from my freezer was a bag of frozen strawberries. I thawed and drained the berries, and combined them with rhubarb to make this pie. In my sleepy state of my mind, I forgot to add any lemon juice into the filling, but the pie still tasted fine. Instead of flour as a thickener, I used minute tapioca (about 4 tbsp for 8 cups of fruit). I made the pate brisee crust in the food processor as I didn't want to get out the mixer. It was a bit dry (I need to force myself to add more water as most recipes don't call for enough) but rolled out alright, with just a few cracks. 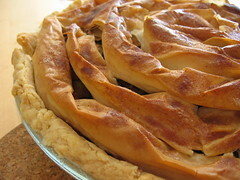 The top is unusual: it calls for sheets of buttered phyllo which are rolled into tubes and arranged in a spiral over the pie. Very successful at the office. I thought the filling tasted salty but couldn't understand why as there was no salt added.